Creative young people are the most likely group to start up a business straight from education. They are often natural entrepreneurs: creative, innovative and visionary with immediately transferrable skills that lend themselves to self-employment. But they are also some of the least likely to have picked up the skills that they need to grow and sustain a business – failure rates are high – and the reality seems to be that once burnt these early starters often never return to entrepreneurship. Youth entrepreneurship is being promoted and encouraged as a way of helping young people into the labour market and promoting job creation, but without business skills and resilience entrepreneurial inclination is no guarantee of success. Research from Global Entrepreneurship Monitor has identified that young people in Europe feel less confident about starting up a business than their global peers, with a strong fear of failure and belief that they are ill equipped to start a business. 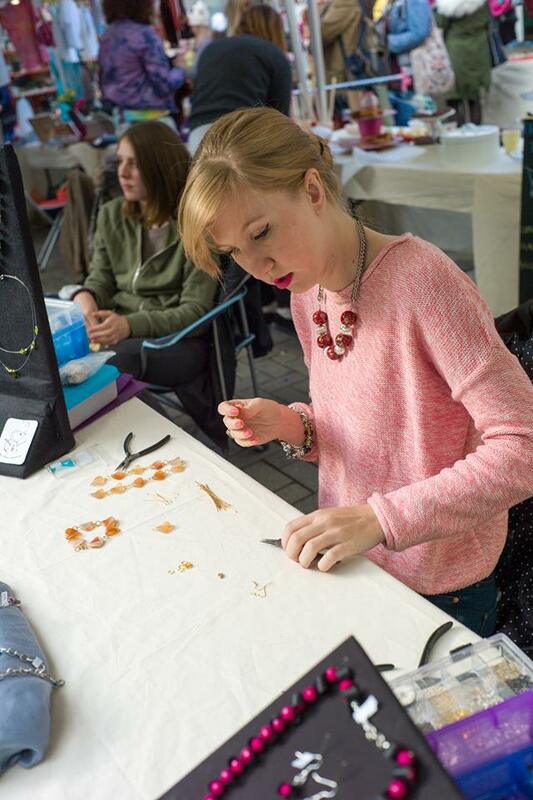 In partnership with Canterbury City Partnerships, Canterbury Council and Canterbury Market and with the support of RSA Catalyst and the Canterbury Festival’s Prosper Programme we have created Student Makers’ Markets, a street-based programme of business and entrepreneurial training. It gives young people a supported space to come and test their business with access to informal training, workshops and on-going mentoring whenever it’s needed. We bring young entrepreneurs together to create vibrant mini-markets within established street markets, festivals and galleries. We supply free stalls and equipment for unemployed young people, graduates and school students from communities struggling with high levels of youth unemployment and other social and economic problems. The ease of selling through online platforms like eBay, Etsy, Big Cartel and Facebook means that many young entrepreneurs are already trading from bedrooms, sheds and kitchen tables. We’ve been surprised at the range of businesses we’ve found, from complete beginners to established on-line shops. Our ethos is to look for the “bright spots”, inspired by the Heath brothers’ book Switch: we look for what’s working and how can we do more of it, the don’t solve problems – copy success. Connecting young people already running successful businesses to those just starting out creates amazing enthusiasm: when young makers meet those of the same age who are making a living from their creative skills it shows them what’s possible. It has been extraordinarily exciting for everyone involved – the market traders, the business community and ourselves – to find just how much drive and talent is already out there. We offer free business advice during the markets and we’ve been astounded at the requests so far. Our assumption was that our traders might ask about setting up a business, accessing government loans or writing a business plan. Instead, we are answering questions from young people about exporting to multiple countries, registering for VAT and employment versus outsourcing. Taking part in a rolling programme of markets and training means the young people can access learning when they feel they need it, from realising that they’re struggling to make sales at one market, to learning vital sales techniques before the next. We want our young people to be excited not just by the opportunities that are open to them, but those which they can create themselves: to make their mark on their community, be visible and to inspire others. A street market is not solely a trading area but also a key aspect of the city’s social capital – people visit for conversation, for connection. It is a place to exchange ideas, network, meet new friends, experience new things. Our project explores this community and how it can develop to meet the needs of the city, its residents and young people.Contact us for more information or sign up for our newsletter.